Very few employers will be spared the unpleasant task of firing or laying off workers. Offering severance agreements is one way to lessen their pain and add a layer of protection for your business. The reality is that whenever you fire or lay off a worker, you’re taking a risk for retaliatory legal action against your business. Did you lay off a lot of women or people over 40 during in a sluggish economy? It may not occur to you when you’re looking over positions to eliminate, but these employees fall in protected categories. Severance agreements protect companies against costly and disruptive wrongful termination lawsuits. Or perhaps you made some mistakes in how you managed or terminated an employee and have good reason to be concerned if a judge or jury reviews this. Can you really be certain that there’s no document or email that could surface and embarrass or harm the company? 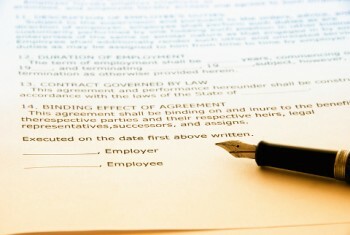 Severance agreements protect businesses from lawsuits while lessening employee pain. Or you might worry that employees you terminate might embarrass the company on social media or other outlets. Consider offering severance agreements. Many employers routinely give severance packages to employees they terminate, even if they are not legally required to do so. They see them as a way to insure and protect the company against costly and disruptive wrongful termination lawsuits. A severance agreement is a signed agreement between an employer and departing employees. The exiting employee(s) promise not to sue their former employer in return for something of value, money called severance pay. Like many other employment matters, there are issues and pitfalls that surround severance agreements employers need to take into consideration before offering them. Under what circumstances should they be offered? What terms should be extended to the departing employee? How about confidentiality? Remember, severance is not typically required by law. They could lead other employees to request them as well if word gets out about them or how generous they are. More than one Arizona employer was discovered to have given more generous severance packages during early layoffs and less generous ones to those laid off at a later time. Businesses need to weigh the cost for providing severance against litigation risks. When I’m contacted for a severance consultation, I ask employers why they think they need such an agreement. What are their goals? Some employers have a combination of these purposes in mind. Severance pay: The amount that will be paid to the employee and in what intervals. Be sure to pay special attention to workers over 40 years old, as special laws apply to their status. My employment law practice can help your business understand what terms to seek in these agreements and a fair package to offer each employee under the particular circumstances. I’ll help you review, negotiate, and draft agreements that protect your business’s current and future interests while ending employment relationships on a good note.